Hiding: Click Turn Hiding On/Off to toggle the automatic hiding of the Dock. With hiding on, the Dock disappears off the edge of the screen until you move the mouse pointer to that edge. (This is great for those who want to use as much Desktop territory as possible for their applications.) You can press Command+Option+D to toggle Dock hiding on and off from the keyboard. Magnification: Click Turn Magnification On/Off to toggle icon magnification when your pointer is selecting an icon from the Dock. With magnification on, the icons in the Dock get really, really big . . . a good thing for Mr. Magoo or those with grandiose schemes to take over the world. Now those are some pumped-up icons. 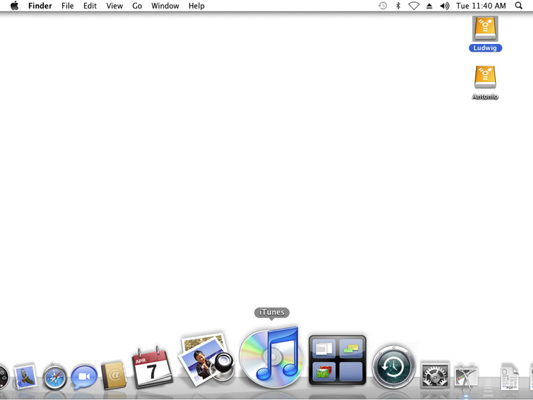 Position: Click one of three choices (Position on Left, Bottom, or Right) to make the Dock appear where you want it. Dock Preferences: Click this to display the System Preferences Dock settings. 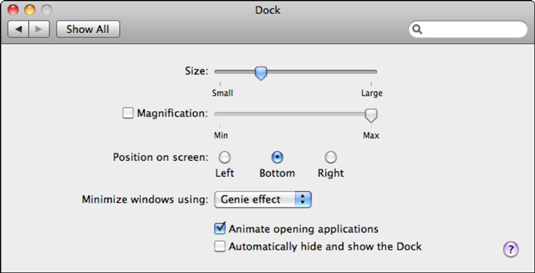 Minimize Windows Using: By default, Mac OS X animates a window when it’s shrunk into the Dock and when it’s expanded back into a full window. From the Minimize Using pop-up menu, you can choose from a genie-in-a-bottle effect or a scale-up-or-down-incrementally effect. To demonstrate, choose an effect and then click the Minimize button (the yellow button in the upper-left corner) on the System Preferences window.